David and I have been fairly busy during our first week and a half as Hood Fellows at the University of Auckland. Our hosts have kindly scheduled all our talks for early on in our stay, leaving time to see the attractions of Auckland and its surroundings. This past Sunday we took a tour of some of the Waitomo Caves, famous primarily for caverns in which thousands of glowworms light up the ceiling like so many stars. It’s quite a long ride by bus to reach the area. This happens to be the off-season for tourists in New Zealand, May being the equivalent of the Northern Hemisphere’s November. So far, however, we’ve actually experienced a streak of unseasonably warm, sunny weather. We happened to be the only passengers on the bus going down to Waitomo, though there we joined a group totaling seven for the actual cave tour. On the way, we initially saw lots of fog and then spectacular mountains and valleys. That part of New Zealand is largely devoted to dairy farms, so we saw many bucolic landscapes full of cows. Our driver, Pete, regaled us with many stories, including how a group of tourists had dubbed his bus (then brand new) Tillie. Pete hadn’t recognized the connection to the old Walter Matthau-Carol Burnett movie Pete ‘n’ Tillie, but he liked the name and has used it ever since. As we neared Waitomo, Pete took us off the main route onto a more scenic road. 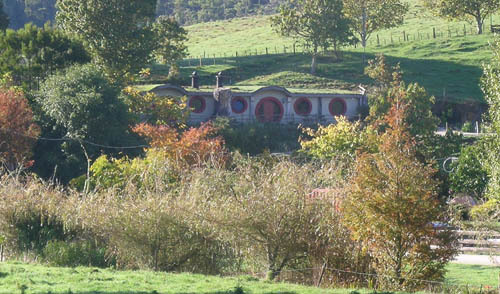 As we drove, he pointed out Woodlyn Park, a motel with themed rooms, including two “hobbit holes.” These look fairly similar to the facades used in The Lord of the Rings, except that the two fronts are joined at the middle, like a Middle-earth duplex, or as the British say, semi-detached. The furniture inside apparently is people-sized rather than appropriate for hobbits. The photos on the motel’s website look somewhat incongruous, with their modern stove and sink, but the beautiful surroundings suggest that for a fan doing an independent driving tour through New Zealand, this would be a pleasant place to spend the night. I had been aware of Woodlyn Park from the period when I was scanning for internet for LOTR-related products for The Frodo Franchise. I had never particularly taken note of where it was, so this unexpected chance to see it, if only from the road, seemed like a fortuitous coincidence. In my previous entry, I mentioned that Māori TV is running a series of classic New Zealand films on Sunday nights. We got back from our Waitomo trip just in time to catch Vincent Ward’s first feature, Vigil (1984). It’s an impressive debut, with brooding images of harsh landscapes punctuated by startling cries of birds. The result looks like a blend of Bergman and Tarkovsky. The film deals with a girl living with her parents on a struggling sheep farm and her efforts to understand the baffling events happening around her without much guidance. Her father is killed trying to retrieve a lost sheep, and her mother, embittered by her lost dreams of becoming a ballerina, tries to force her tomboy daughter to start practicing in the hope that they soon can leave the farm behind. Into all this wanders a vaguely threatening poacher who may or may not have illicit designs on the heroine. Told largely from the girl’s point of view, the result is a grim but fascinating study in character and mood. It’s a pity that Vigil is not currently available on DVD, though used copies with various region codings are knocking around the internet. Again, it’s a pity, because although it’s not a masterpiece, it’s an entertaining and engaging period adventure involving a woman who goes into the New Zealand wilderness to rescue her kidnapped son. It is done on an epic scale that deserve to be seen on the big screen. Rumors of various problems that plagued and prolonged the filming have given River Queen an undeservedly bad reputation. Apart from a bit of choppy exposition at the beginning, I saw few signs of the fact that Ward had not been able to finish all the planned footage. Samantha Morton’s illness (and rumored clashes with Ward) delayed the film, but she gives an intense and convincing performance. So does Cliff Curtis, an excellent Māori actor (The Piano, Once Were Warriors, and Whale Rider) who has also turned into an all-purpose ethnic player, cropping up in a wide variety of roles—often Arabs—in such films as Three Kings, The Insider, and the current Sunshine. The series is one of several in the Qubo agreement, whereby NBC and other companies pledge to promote quality children’s television. Perhaps this constitutes an admission that that’s not what we’ve been getting up to now. The first episode of Jane and the Dragon was charming, though it definitely was aimed at small children. The original book has been reissued as a tie-in to the series, and the Amazon description lists it as suitable for ages 4 to 8. For me the series’ main interest lies in the innovative technique Weta Workshop has developed to aid in the CGI. When I first interviewed Richard Taylor, head of the Workshop, back in October, 2003, he emphasized that his company depended very little on digital technology. In contrast, the other half of Weta Ltd., Weta Digital, is entirely computer-based, providing the cutting-edge CGI not only for The Lord of the Rings but also King Kong and sequences in I, Robot, X-Men 3: The Last Stand, Eregon and others. By our second discussion, in December, 2004, Weta Workshop was moving more toward digital technology. A new motion-capture studio was just beginning to be tested. No doubt the Workshop’s designers will continue to emphasize real props, maquettes, prosthetics, and similar objects, but it has branched out. 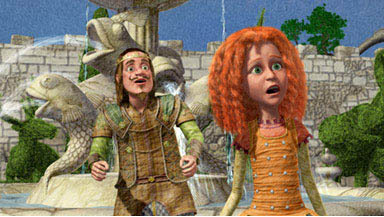 The result in Jane is a world that resembles a series of detailed colored-pencil illustrations from a children’s book. The world is three-dimensional, however, with the characters created in sophisticated motion capture and the “camera” gliding freely through the “drawn” space. The effect is a little disconcerting at first, with the characters in lively motion and the backgrounds utterly still. Once one gets used to the contrast, however, the effect is pleasant and technically very impressive. Despite the use of motion capture, the characters are stylized rather than realistic, like detailed cel animation but in 3D. Tomorrow I am scheduled to take the ominously named “Mordor & Mt. Doom Express.” This is a lengthy drive out from Auckland to the area around Mt. Ruhapehu, where Frodo and Sam struggled up the mountain to destroy the Ring (when they were not doing the same thing against blue and green screens in the studio). The point is not just to visit the movie locations from The Lord of the Rings, though. Naturally the filmmakers chose some of the most dramatic scenery in the country to embody Middle-earth—places a tourist would want to visit quite apart from their appearance in the movie. Then on Sunday I’m headed for a brief stay in Wellington, where I spent many exciting weeks doing the interviews and facilities tours that constituted much of the research for The Frodo Franchise. I hope to be able to report from there in my next entry. Glowworms show up as tiny green lights. 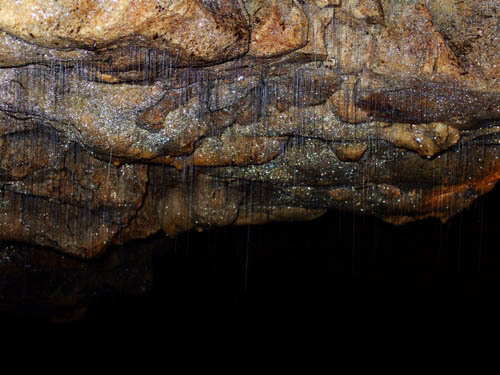 They spin single strands that hang below them and catch small insects drawn into the cave by air currents. This entry was posted on Thursday | May 17, 2007 at 4:30 pm	and is filed under Directors: Jackson, Film comments, National cinemas: New Zealand, The Frodo Franchise. Responses are currently closed, but you can trackback from your own site.